The subject of police brutality is a growing issue, but the simple fact is that African Americans are scared to have encounters with police officers. They are seeing other African-Americans getting killed in the media and get scared that, that is going to happen to them as well. As a black person, I can personally say from experience that when I see photos or videos on the news of people that look like me being treated violently just because they are black, it scares me. It also makes me think that the same thing could happen to me just because of my race. It is a shame that many African Americans have to be taught a certain way to act around police. When just simply walking down the street, if a police car rolls by, it would strike worry in a black person. Our young African American children watch these stories on the news, giving them a negative view of not only police but of society in general. These videos make young black children think that their lives do not matter as much as everybody else’s, and gives them less hope for the future. Nobody should be violently handled because of race or anything else that makes them different. It is a shame that there is a stop and frisk policy that states that without statutory provisions, a police officer has the power to stop, question, and frisk suspects. Most of the time, this is used to the officer’s advantage to stop and frisk anyone they see, mainly being innocent African Americans. When an African American is injured or murdered by a police officer, the officer barely suffers the consequences. Instead of getting reprimanded they are excused for their inexcusable actions. This issue is rapidly taking the lives of not only African Americans but also minorities in general. A certain group of people should not be singled out based on any physical feature. Race is something that defines a person and cannot be changed. If people are getting unlawfully assaulted and killed and being singled out because something that they cannot change, what does that say about America as a whole? The fact that this is even an issue in society is sad, and something needs to be done to change this. To conclude, everybody should be treated equally, and no one should be singled out or considered less than because of his or her race. Throughout America’s history of slavery and segregation, these kinds of acts should not still be going on today. African Americans struggled to fight for the same rights as everyone else and not to be discriminated against. Many people may think that just because the actual acts of slavery and segregation are not occurring that racism does not exist, but it still does. Until EVERYONE can truly be accepted for who he or she is, it always will. Nobody should be judged by the color of their skin, but by the content of his or her character, and until this happens, we are not truly united as one. 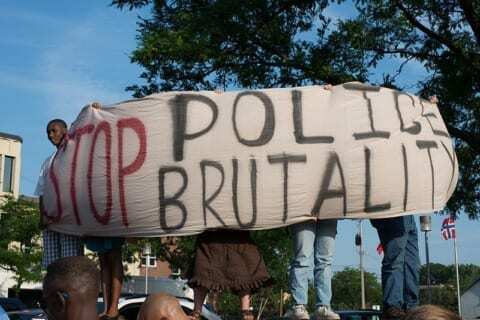 Police Brutality by Jada is licensed under a Creative Commons Attribution-ShareAlike 4.0 International License. I agree with you 100 percent because police brutality is a huge issue that’s happening in the United States right now. Excessive force or even worse getting shot has been making not just African Americans but also Latinos or any race honestly. Police do take all the power they have to the head, mainly targeting anybody who is innocent. Everybody has the same rights, it shouldn’t be one side has rights and the other doesn’t, one side being able to relax and enjoy life, while the other has to constantly watch there backs making sure they have everything that wont get them shot or hurt or anything. I agree with you that many people are scared of the police not just because they think they might get arrested but because sometimes some of the cop’s could get a little aggressive and start hurting someone. I don’t think it’s fair that many people get hurt by the police just because of their race or anything else. In my opinion I think it is really horrible and unfair that all these people are getting hurt for no reason because even if the victim did something bad that doesn’t mean that they should go and hurt them more. Many people get hurt just because of their race and many other things and police should stop abusing them. If someone was being abused by a police then they should report that cop.